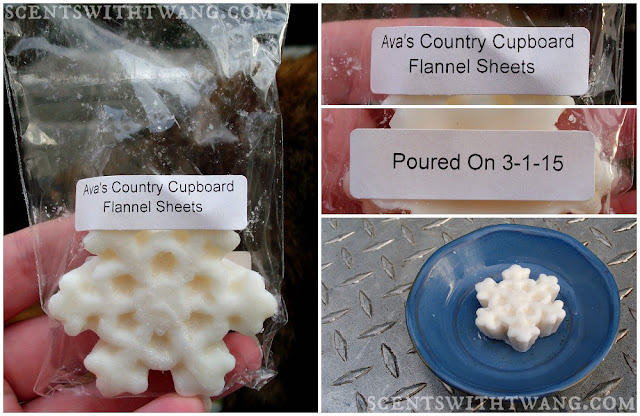 Today's wax melt review is of Flannel Sheets from Ava's Country Cupboard. I purchased this melt directly from the wax vendor's web store. I have melted a lot of different scents from this vendor. I get great performance from them for the most part. So, I am hoping this one will do quite well for me. It smells like fresh laundry or a dryer sheet. After about 3 and a half hours, it's still going strong. There is still a medium fresh laundry scent throughout my living room and even into my dining room. A little more than 4 hours in, it's still rocking. I go into the living room and I can smell a nice medium scent of laundry like dryer sheets. It's not smacking me in the face like some other laundry wax melts I've tried, but it's very pleasant and noticeable. There was a nice laundry scent throughout my living room until a about the 7 and a half hour mark. Then, the scent started to fade off until I could only smell it within a foot or two of the warmer. This one did even better than I could have hoped! I am beyond happy with it. I can't believe it did as well as it did in my living room. That room is a black hole for scent throw. Only the best survive in there. This melt is also 8 months old. So, it has held its scent amazingly well. This is definitely in my top scents from this vendor to repurchase. I think it may be my second favorite after Sea Salt and Rice Flower. Oh yeah! *Not sponsored. I bought this special snowflake myself. First, let me say, I am not affiliated or a consultant for this company nor do I personally know any. I am just a curious, weird, and wax obsessed cat lady who made an order from the web site. This is one of those brands that I've been curious about even since I first found out about them. I had only seen glowing reviews, but I'd never seen a review that wasn't from a consultant from this direct sales company. So when they had an awesome coupon code promotion going awhile back, I thought I'd pick up a few of the 3.75oz jars and see how they perform for myself. In my opinion, this is not a masculine scent at all or at least not one of which I'm familiar. It runs more towards earthy perfume for me especially with the lavender and musk akin to something an amazing mature woman would wear when she is decked out in her Sunday best. I like it just fine, but it wasn't the scent I was expecting at all from the description. As for the performance, it throws amazingly well. I put just a few sprinkles in my tea light warmer, and it filled half my house with a super strong throw for hours. This smells like straight up cedar wood. It even has the spicy bite in the scent that freshly cut especially fragrant cedar has. Very nice! As for the performance, this one does very well, too. I put some in my tea light warmer, and it scents the whole house for several hours. This smells simply delicious! The strongest note is the vanilla wafers with a sweet candy banana behind it. As for the performance, I've melted this one the most out of any of the items in this haul. The jar is half gone. Haha! It does pretty well. It's the best performing banana pudding type wax I've come across so far. I usually get a medium throw in my tea light warmer that fills up one of my smaller rooms for at least 5-6 hours. I get sandalwood the most in this one for sure. It greatly overpowers the patchouli. This scent makes me so happy as I used to burn incense constantly. As for the performance, this one is super strong! This is probably one of the strongest wax melts I've ever melted by far, and I didn't even use that many wax sprinkles. This one seriously just smacks you in the face. I started this one out in my tiny bathroom, and it was way too strong in there. So, I moved it out into the main living area in the center of the house. It scented the entire house for the better part of 3 days, and it even lingered in a couple of the rooms for days afterwards. I was all about that life. I will probably use even less wax next time, because it is that strong. This smells just like the "New Car Scent" air freshener spray that you can get for your car at the store. It also smells just like the little blue tree you can hang from your rear view mirror as well. I haven't melted this one yet, but it's about a medium on cold. I thought that was a nice touch that you rarely see with non-vendor wax. The wax sprinkles are also pictured above. They are about the size of those laundry beads from Downy and such. I have to admit that I am pleasantly surprised by these products. I expected them to not be good at all since I had only seen what I perceived as biased reviews from sellers themselves. When there are that many positive reviews, I start to get skeptical. These 5 scents turned out to be pretty awesome for me. Some were stronger than others. Patchouli Sandalwood could smoke your enemy out of hiding if used properly. So, it's definitely my favorite. The weakest is Banana Pudding, but it's still on the level of a really good retail store melt like Scentsationals. I really like the little sprinkles or wax beads. 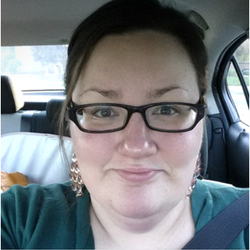 It lets me better control the amount of product and really get more bang for my buck. I've also seen people mix several scents together to make their own blends. I'm too lazy to do that, but that is really cool. I also really like that they came in heavy duty glass jars. It makes me feel better about the price, and I can repurpose them when I am done. Oh yes. I would buy from this company again on a good sale for sure. 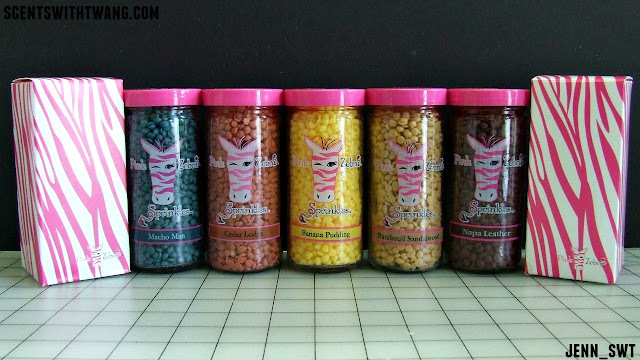 These 3.75oz sprinkles jars full retail for $8 which is a bit steep for me especially when you also have to pay for shipping if you order online. I will say that the product does last a lot longer than cubes or chunks. I have melted Banana Pudding more than 5 times and I'm only halfway through the jar. Keeping in mind what a lot of wax vendors charge for scoopables and such, it's not even that high priced for the market. I ordered this back during summer, and I live in the South. It was not exactly wax ordering weather. Imagine my delight when my order came packaged with freaking cold packs. How awesome is that crap? It made me feel a lot better about the shipping charge. Haha. That was seriously just awesome, though. I didn't like that I had to order through a consultant even though I was just browsing the web store and wanted to order. I mean, I'm glad some random lady three cities over made a sale and possibly a commission, but it was a hassle and made me feel a bit uncomfortable. I just wanted to checkout and pay for my wax and not have to go through a whole process where I had to pick a consultant. Ya know? I understand that this is a direct sales company, but I still felt weird about it. I wonder if Scensi and other like companies are the same way. Probably. *Not sponsored. I bought these myself even without a consultant or anything. I was just that curious...and strange. 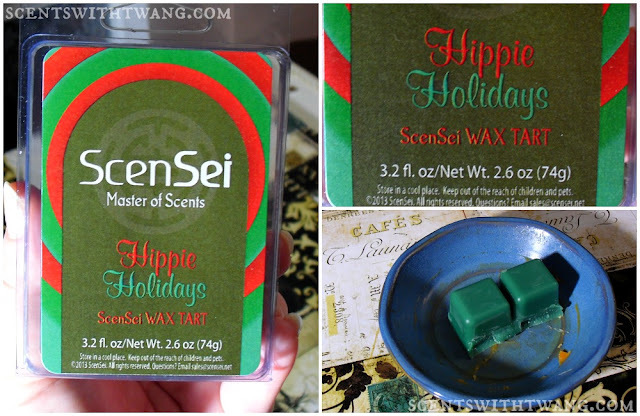 Today's wax melt review is for Hippie Holidays from ScenSei. I ordered this one directly from the vendor's website. Official Scent Description: Wow! An earthy blend of fresh patchouli, herbal sandalwood and hints of strawberry and raspberry with base notes of peppermint and evergreen. A wonderful holiday scent! This is the first wax melt I've ever tried from this vendor. I've not really seen any reviews either. Most of the things I've seen have been for their jewelry tarts which aren't really my thing. They have an awesome website and branding. So, I am hopeful. I definitely get a mix of earthiness with mint and evergreen in the background. It evokes memories of when I used to go to New Age stores all the time to buy incense and what not, but the mint and evergreen make it really interesting. I don't get any strawberry or raspberry at all. The scent is very light on cold, though. Throw Notes: It filled my entire kitchen and the connecting dining room within the first half hour. I'm loving it. It's very strong. After 2 hours, a medium scent throw has filled the kitchen, dining room, and even creeping into the living room. Sweet! After 4 hours, it's still going strong. The throw has barely gone down at all. I may have to switch it off and remelt it tomorrow. This is great! I remelted it the next day and it was strong for about 10 hours. Then, it slowly faded for the last hour. Wow! Holy crap! This one more than exceeded my expectations especially since it was quite light on cold sniff. This is one of the best melts I've melted so far. Like ever. I am stunned. I have a few other scents that I ordered with this one, and I can't wait to see if they do as well. *Not sponsored. I bought this with my own money. This post reflects my opinion based on my experience with this particular melt. Your experience may vary. 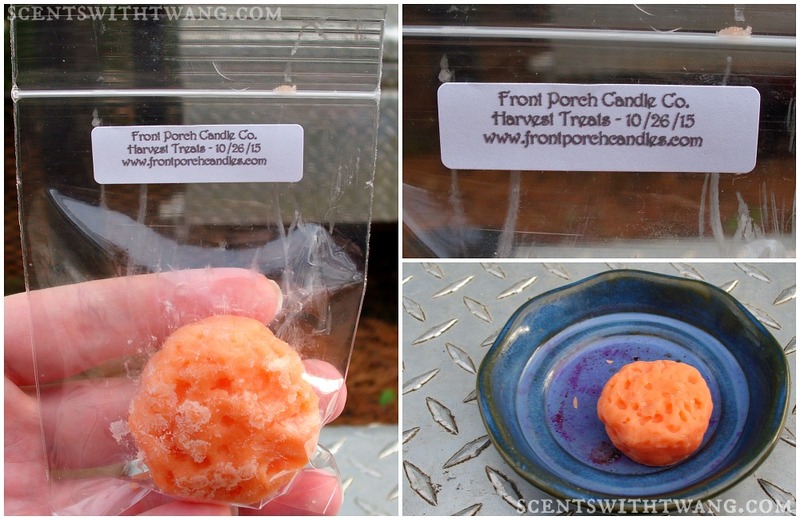 Today's wax melt review is of Harvest Treats by Front Porch Candles. I picked this little grubby tart up directly from the vendor's web store. Official Scent Description: Blend of Sweet Potato Pie, Marshmallow, Sugar Cookies, Caramel, and Angie's Famous Cupcakes. This is the first melt I've ever tried from Front Porch Candles. I've heard pretty good things about the performance of these wax melts. So, I expect it to do fairly well. This is definitely a sweet, syrupy bakery scent with a background of fall scents. It's very strong on cold. After a little over an hour, the scent has filled my entire kitchen, the adjoining dining room, and into 2 other connecting rooms. It smells like spicy and sweet bakery goodness in here. Yes! At the 3 hour mark, it has definitely died down a lot. The scent fills up half my kitchen. It is also different in that the marshmallow and bakery notes are in the front with barely a hint of caramel behind it. It's not nearly as nice as when it started. The scent is pretty much gone a little after the 4 hour mark. I have to be right up on it to smell anything, and the only note I'm getting is a sweet artificial vanilla. This wax melt did pretty well for me. I do wish the strong throw that I got initially would have stayed around a bit longer. It seemed to taper off pretty quickly compared to other melts I've tried. I have a bunch more scents from an order I made to try, and I can't wait. Front Porch Candles has the best web store and ordering system of any wax vendor I have come across thus far. It is one I wish all vendors had. 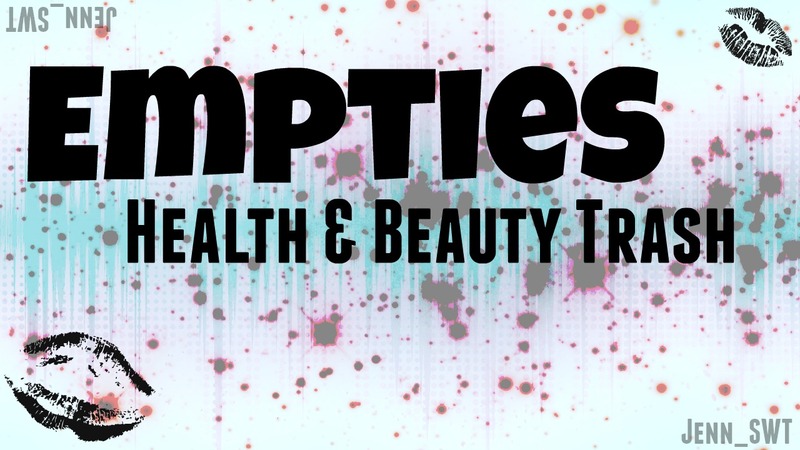 They do free shipping, constant promotions, a huge variety of scents, and your order gets to you fast. I was beyond impressed. My favorite thing is that you don't have to be on Facebook to order or find out about promotions. They have an email newsletter that alerts subscribers of restocks, promotions, and etc. As someone who is never on Facebook or don't have the time to fool with groups, it is absolutely wonderful. I also think that this makes their products accessible to so many more people. *Not sponsored. I bought this dude myself with my pitiful funds. *This review is based on my experience with this particular melt. Your experience may vary. 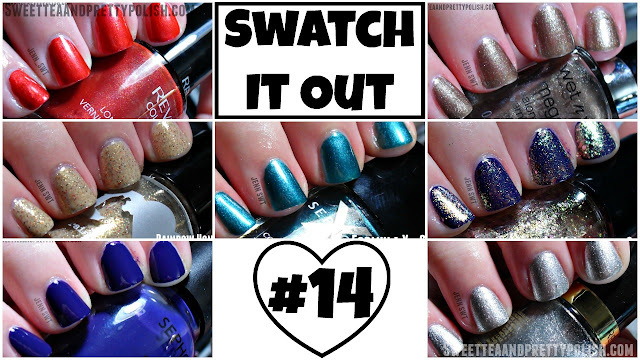 It's time once again for another Swatch It Out. Oh yeah! If you aren't familiar with this series, I take seven random nail polishes from my collection and swatch them for y'all. I also talk about the formula and wear time and whatnot where applicable. I post this series every other Tuesday on here and on my youtube channel. Enough of that crap, let's swatch it out! I bought this polish from Walmart for the full retail price of $1.97. The formula was nice. It went on very easily without any trouble. 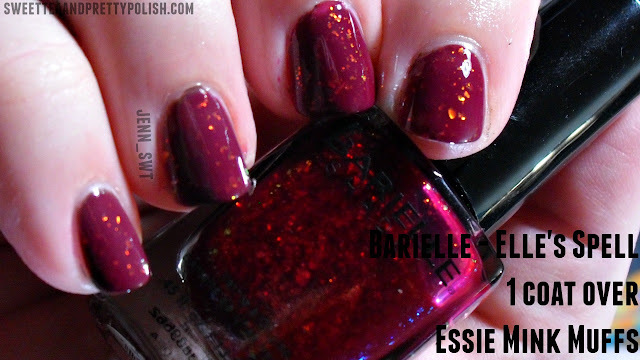 I am bummed that the pretty shimmer that is so apparent in the bottle doesn't translate to the nail. The shimmer really made it special. I bought this polish at Big Lots for $1.50 last year. 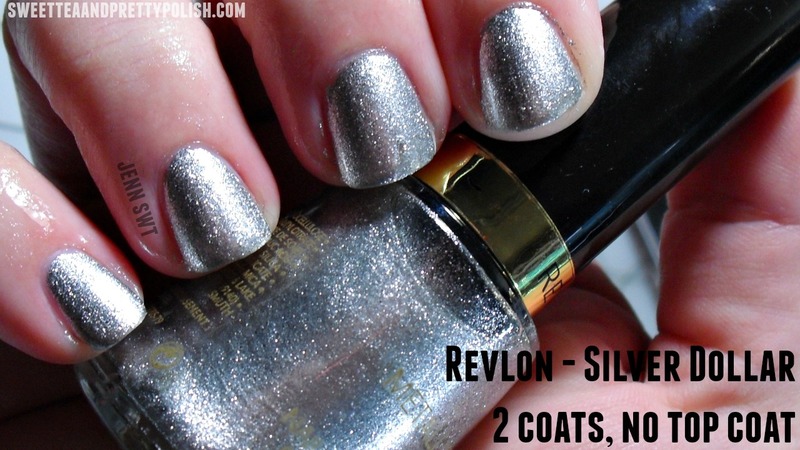 The formula on this polish is amazing! It just glides on the nail smoothly. If I had a shorter nail line or done a slightly thicker coat, I could have gotten away with one coat. 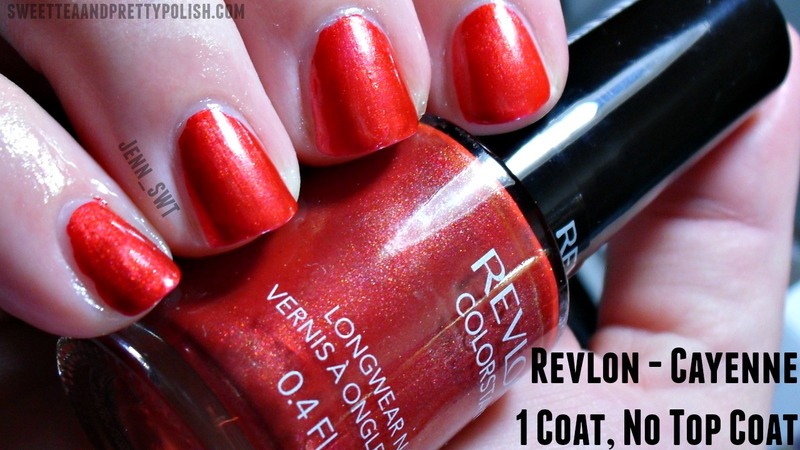 I have worn this one a few times as a manicure, and I always get the better part of a week out of it with a top coat. I picked this one up from Dollar Tree for $1. I absolutely love these pale pink colors. Unfortunately the formula was pretty bad. It was just thin, runny, and hard to manage. It also showed any imperfections, like the peels on my middle finger, really badly. If I have any similar colors in my collection, I may retire this one despite loving the shade. 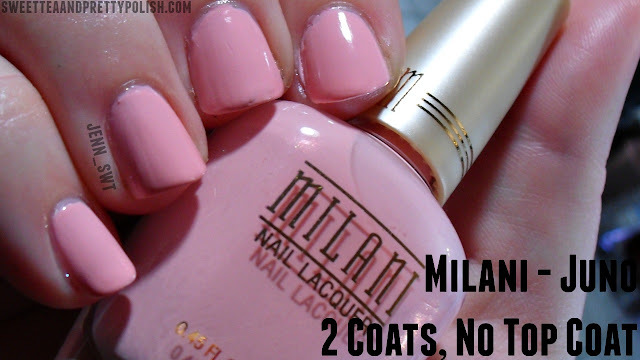 The picture above shows 1 coat without a top coat over Milani Juno under a daylight bulb. I picked this polish up at CVS a while back during a sale. The formula is pretty good. It's not too thick, and fishing isn't required for glitter. I am really underwhelmed by it, though. It looks so gorgeous in the bottle and quite lackluster on the nail. This one also has that strong chemical paint like KleanColor and Broadway Nail have. I may use this one as a craft paint despite it having a good formula, because I feel like I could better utilize the awesome glitter in such an application. The picture above shows 3 coats without a top coat under a daylight bulb. It is also showing a blue tint in the picture which isn't how it looks in person. It's a dark charcoal gray in person. I picked this polish up at CVS during an extra care buck promotion. The formula is very thick and takes forever to dry. Despite being really thick, I needed 3 coats to reach opacity. It was very streaky. The shimmer in the bottle didn't translate to the nail much at all. I've tried to wear this as a manicure twice without success. Even hours after application, I get major dents. It's even worse with the Gel Envy top coat. To be fair, I haven't had any luck with these "Gel-like" polish lines yet. I picked this polish up at Kmart over a year ago on clearance. The formula is decent. It is one of the best Essie formula I've come across so far. I don't have much luck with them. It goes on fairly smooth without much trouble. 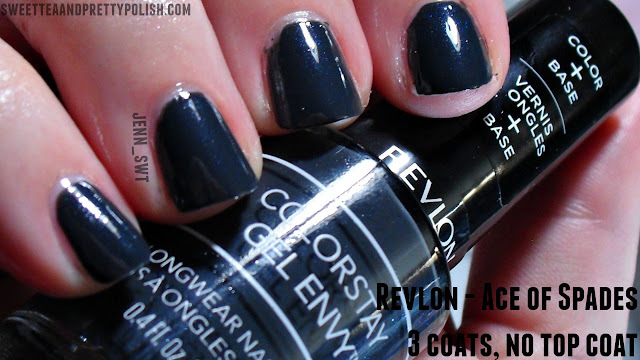 I've worn it a few times and get decent wear: usually around 4-5 days with a top coat. This is one of the first Essie polishes I ever owned. So, it makes me happy to even see it. 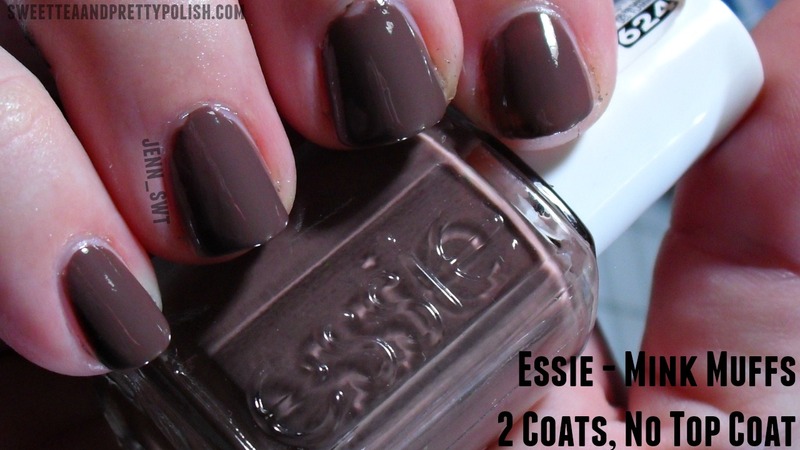 The picture above shows 1 coat without a top coat over Essie Mink Muffs. I picked this polish up directly from the company website during one of their many promotions. I've never come across another polish like it. It's definitely one of my favorites in my entire collection. Fall Mood had the best formula. I will forever be obsessed with Elle's Spell as well. Ace of Spades' color is not unique enough for me to justify 3 coats, and it take forever to dry. I also feel that I can use Sparkle-Fetti better in a craft application. It also just underwhelmed on the nail. *Not sponsored in any way. I bought all these with my own money. 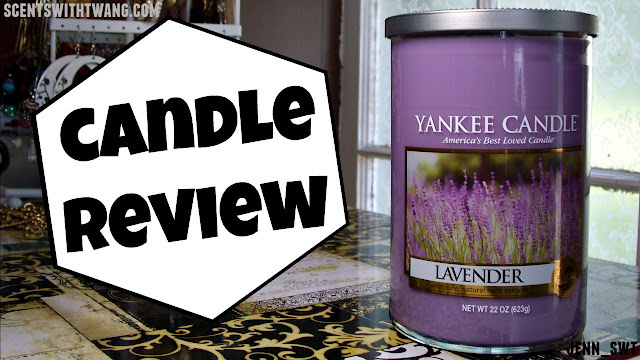 Today, I am doing a candle review of Lavender by Yankee Candle in a large tumbler. I picked this candle up from the company's website during a glitch sale. The full retail price is $27.99, but there are promotions going on constantly. Official Scent Description: Powdered lavender bundles tied with heather that is both soothing and luxurious. I'm honestly not expecting much of anything. I've had little to no luck with most of the Yankee Candles I've burned so far. They've been downright pitiful. It smells like straight up lavender essential oil to me. I like it very much. Burn: The burn made me sad since I had to quit before I could finish the candle. It became dangerous. The flames got very high quickly despite me trimming the wicks often. One of the wicks also drew ever closer to the side of the glass. This led to a big hole being burnt in the plastic label on the side of the candle. The sooting wasn't too bad, but it was still just a crappy burning experience. Throw: The throw was freaking legendary! That is the main reason I hate that I had to blow it out early. It was filling my entire house. It was stronger than a lot of wax melts I use. Just amazing! I am torn with this one. I am over the moon about the throw, but the burn was pretty crap. I would probably buy another one of these in the future to see if the burn is any better. I'm thinking the issues I had are specific to this candle. Time will tell, I reckon. *Not sponsored. I bought this candle on a glitch sale with my own money. **This is based on my experience with this particular candle. Your experience may be different. 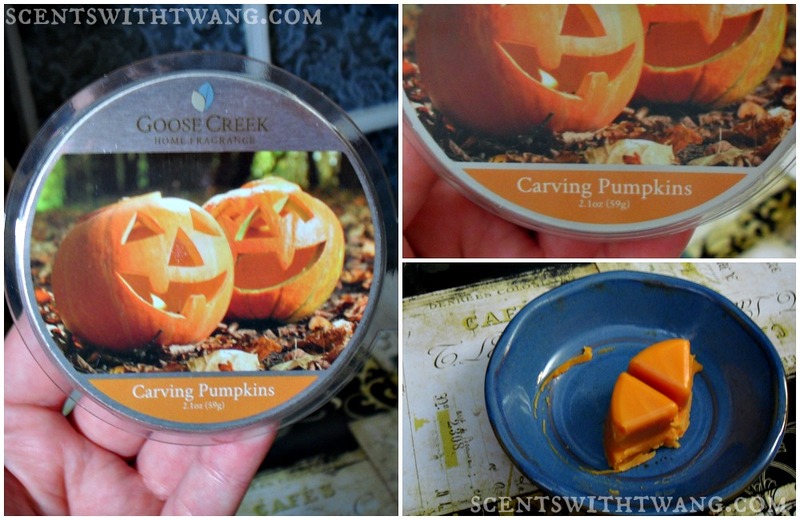 Today's wax of the day review is of Carving Pumpkins by Goose Creek Candles. I purchased this wax melt directly from the company's website during a promotion. I have melted a few wax melts from Goose Creek Candles, and I've been very impressed with them so far. The hits have been major hits, and the worse any have been is really good. So, I have my hopes high. This is a really unique fragrance for fall. The first note is one that makes me think of a really young pumpkin or green white wood. I get some spice and earthy notes behind that. Throw: After about a half hour, it has filled my entire kitchen and has almost scented the adjoining dining room as well. After about 2 hours, it was super strong. My father exclaimed that he would need a gas mask to walk through the kitchen. It was stout, and I was loving it. The spicy notes are coming out more now. After about 4 hours, it died down quite a bit. It is staying my kitchen and filling that room with a medium throw. At the 5 hour mark, I could only smell it if I put my nose right next to the warmer. So, I'm calling it done. I was very happy with how this melt performed. I've not had any weak performers from this company yet as far as wax melts go. I also appreciate the uniqueness of the scent. It's nice to have something other than apple, cinnamon, generic pumpkin spice, and bakery and the various combinations thereof for this time of year. *Not sponsored. I bought this product with my own money. These views are based on my experience with this particular wax melt. Your experience may vary. Here is a small Dollar Tree haul from when I went into the city this past Friday. 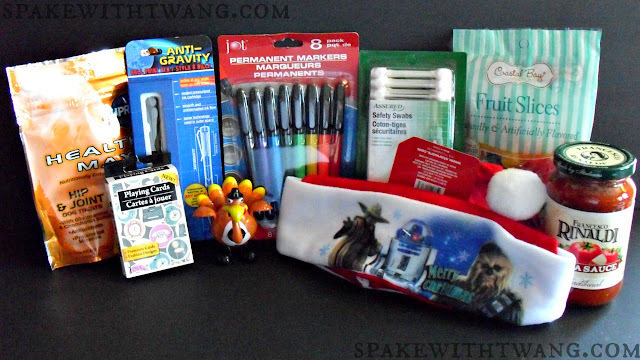 I picked up some staples of mine, as well as, some items that are new to me to try. I have had these in other hauls on the blog. We've been giving these treats to our old dog for months now, and they seem to help a lot with his joints and whatnot. We even took them with us on the last vet visit, and our vet said they were good. I saw this and thought it would be neat to put my dad's stocking for the holiday. So, I can't really tell y'all if it's worth a crap or not as I can't open it. I bought these to use in crafts, but I play a mean card game on occasion. Oh yes. No one is surprised that I picked this guy up as I am severely addicted to these dancer dudes. I do think last year's turkey was better, though. I decided to pick these up after my knockoff Sharpie markers from the flea market finally bit the dust. I really don't expect much from these. I was pleasantly surprised when I road tested them on some notebook paper. They all wrote fairly well, and none were dried out. I'll know more after I use them for awhile in my paper craft projects and whatnot. They are definitely not the same as Sharpie ones, though. They smell different, and the tips are much harder. Wow, Star Wars at the Dollar Tree?! Star Wars is now under Disney?! Maybe I really do live under a rock. Things have changed much since the Episode 1 movie days when I used to follow the franchise more closely. Oh well. I got this for my oldest nephew. I thought it would be something to add to his box. So buy I did. I have been on the hunt for these for weeks. Curse of the Dollar Tree: the store shall always have the item until you need it. Then it shall never be found again. Thankfully, I was able to find some again. These are like insanely overstuffed q-tips. I got them to use on the animals' ears. I'm always afraid I'll poke too far with the regular ones. I switched it up from my Circus Peanuts. Oooh adventurous girl right here. You can also find it at Walmart for around $1.30, but my Dollar Tree seems to always stock it. 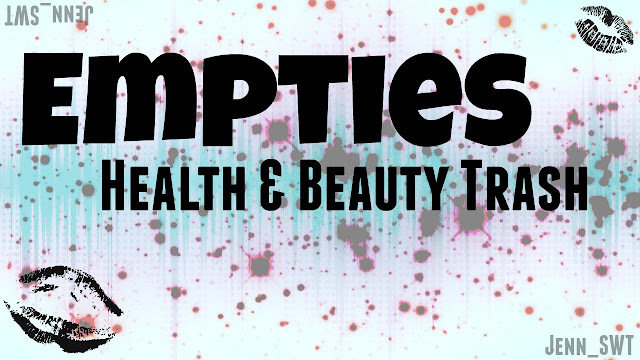 It is finally Empties Review time once again! If you aren't familiar with what this is, I basically save all my health and beauty trash from products that I have completely used up. Then, I give mini reviews for each of the products and tell y'all if I would repurchase them or not. Finger Paints - Are You Van-Goghing My Way? 1. I received this in an awesome friend mail from Trisha Fernandes. You can check out her youtube channel HERE. This didn't bias my review in any way. My opinions are based on my experience with these particular products. Your experience may vary and blah, blah, and le blah. 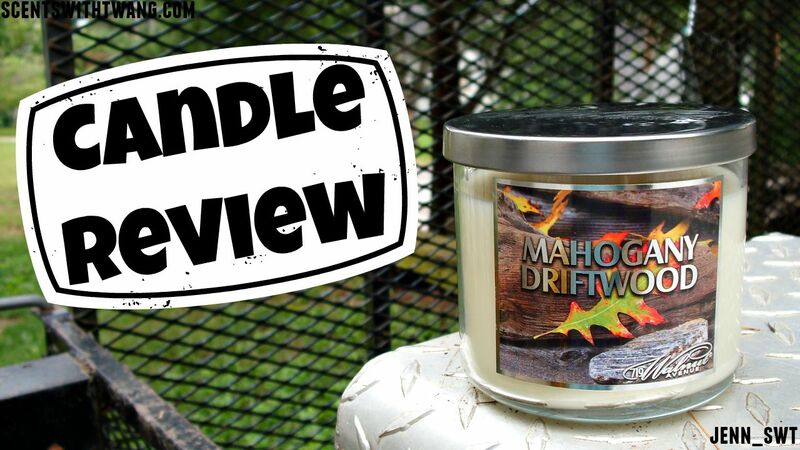 Today's candle review is of Mahogany Driftwood from 719 Walnut Ave. I picked this candle up from my local Walmart for the full retail price of $4.97. A lot of people across the internet have dubbed these candles "Bath & Body Works Dupes" and not without good reason. The packaging is similar, the 3 wicks, and the very similar scents names and notes. This one is said to be a dupe of Mahogany Teakwood which is one of my favorite Bath & Body Works candles. The pressure is on. I usually have pretty good luck with this candle brand. In fact, I've only had one that burned poorly which was Pumpkin Latte from last year. I have heard nothing but good reviews for this candle. So, I have high hopes. It smells pretty true to the description on cold. The strongest note is a musky cologne while a fragrant wood and light floral notes are behind it. Does it smell similar to Mahogany Teakwood from Bath & Body Works? I think it does, but it is definitely not identical. I smelled them side by side and felt that the Bath & Body Works candle was stronger on cold and not as equally balanced as this one as far as the scent notes go. For reference, here's the newest official scent description for Bath & Body Works' Mahogany Teakwood: "Fill your home with the classic luxury of mahogany, oak & frosted lavender"
Burn: The burn was amazing! It made a deep and even wax pool very quickly each time. There was barely any wax left stuck to the sides. There was no soot. I didn't even get hardly any wick crud in the bottom. I wish all candles could burn like this one did. Throw: I would put the throw at a medium. It did very well in my small and narrow bathroom, but it got lost in my living room and kitchen. There definitely was a decent throw that was consistent throughout. I did notice that the other reviews of this candle that claimed really crazy strong throw had different packaging than the autumn leaf one I had. They either had oars or a river with a branch on them. So, I did purchase one in different packaging that I want to test later as well. As for this particular candle that I bought, the throw was just okay and had to be in a small room. This candle did great for me especially when you consider the full retail price is under $5. It did better than most of the over $20 retail price candles that I've burned. Is it the same or even better than the Mahogany Teakwood by Bath & Body Works? I don't think so. I think they are very similar to one another but not the same. I like both of them. I do believe Mahogany Teakwood is a slightly stronger thrower, but, as stated above, I've bought another Mahogany Driftwood in another packaging to try. If I had to choose one or the other, I would choose the 719 Walnut Ave candle since it is like than 25% of the Bath & Body Works candle price. So, I could enjoy more than 4 great candles for the price of one. It's a no brainer. *Not sponsored. I bought this with my own money and all that good stuff. This review is based off of my opinion and experience with this particular candle. Your experience may vary. Yadda. Yadda. Yadda. 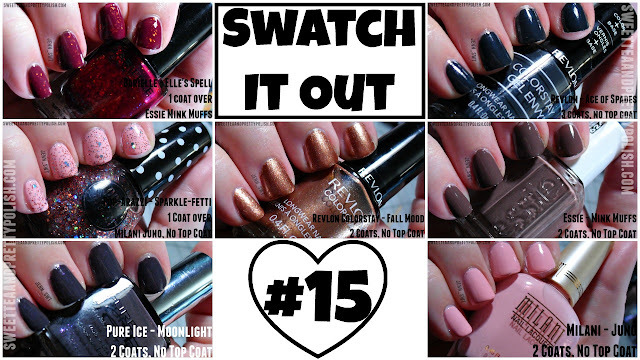 It's nail polish swatch time once again! The seven polishes that I have for you today range from $1 to $10 and include some of my old favorites and a couple hidden gems that I have been hidden in my collection all this time. This picture above shows 1 coat without a top coat under a daylight bulb. 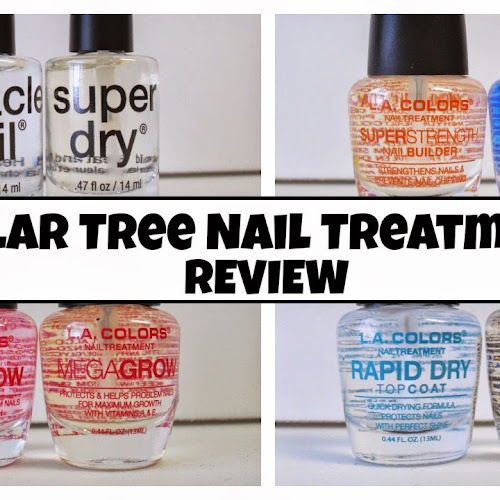 I picked this one up at Big Lots for $1.50 awhile back, but these polishes are showing up other discount stores like the Dollar Tree for a dollar. Polishes like this one are the reason I started doing this live swatch series. It is just absolutely amazing, and it would probably still be sitting on my shelf unopened if I hadn't made a commitment to go through each of my polishes. The formula is good. It is a hair on the thin side, but nothing that causes application problems. And it's opaque in one coat! Yes! I received this polish in an awesome friend swap from Beth on a Budget on youtube. You can find her channel HERE. 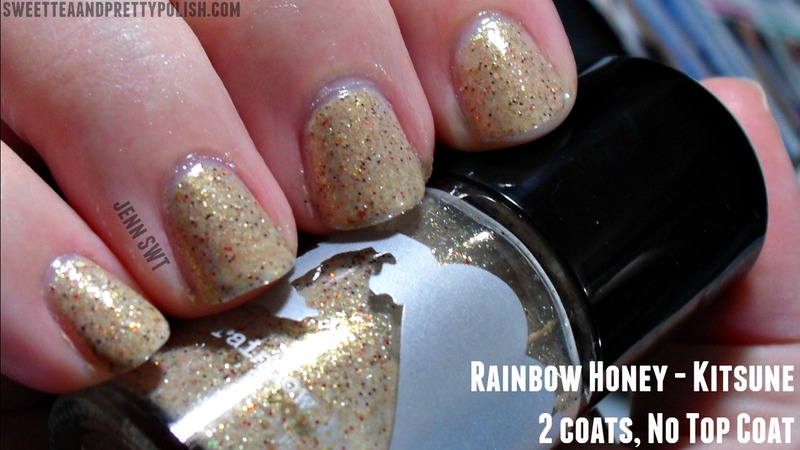 This polish line is found in a lot of retailers and usually runs about 2 dollars. The formula on this one is awesome. It just went on so smoothly and easily. It can run a wee on the sheer side. The picture above shows my nail line more than what you would see in person, but I probably could have benefited from a 3rd coat. The picture above shows 3 coats without a top coat under a daylight bulb. I picked this polish up quite awhile ago from Big Lots for under $2. This line is still being made and sold at Sephora stores but in a newer packaging. This is another surprise gem that I would have missed, because it's been sitting in my collection since I bought it with the seal still around it. It doesn't look special in the bottle, but it's amazing on the nail. The formula is pretty good. I probably could have gotten away with 2 coats, but I went ahead and did a third since I have some peeling on a couple of my tips. I'm obsessed and in love! The picture above shows 2 coats without a top coat under a day light bulb. I picked this polish up directly from the company's web site awhile back. I actually picked up the entire Yokai collection of which this is a part and did a post. So if you want to see what this one looks like outdoors, as well as, the others from that collection, you can find that post HERE. 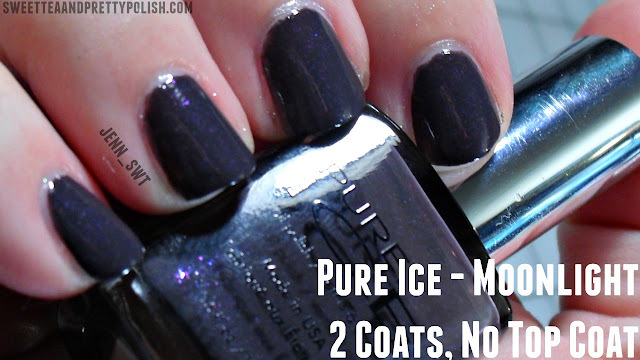 The formula on this polish is great, and it's one of my favorites for this time of year. The picture above shows 2 coats without a top coat under a daylight bulb. The picture is cooler in tone than how the polish appears in person. 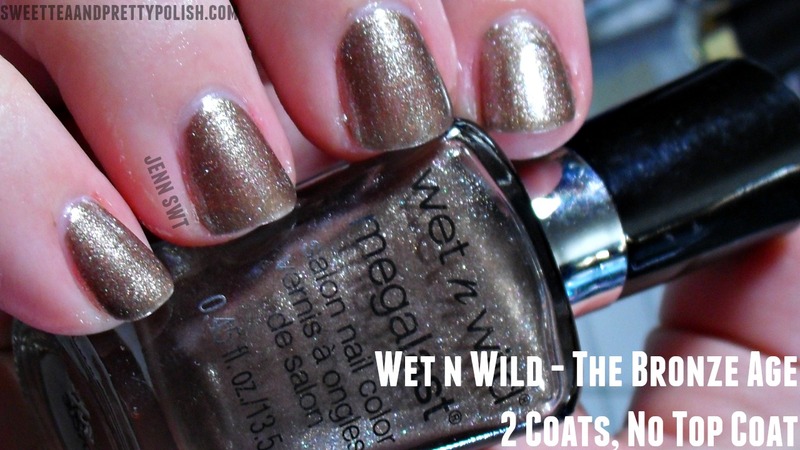 It also dries darker on the nail than it appears in the bottle. I picked this polish up awhile back at Big Lots for $1.80. The coverage is very nice and smooth after 2 coats. It also dries very glossy. 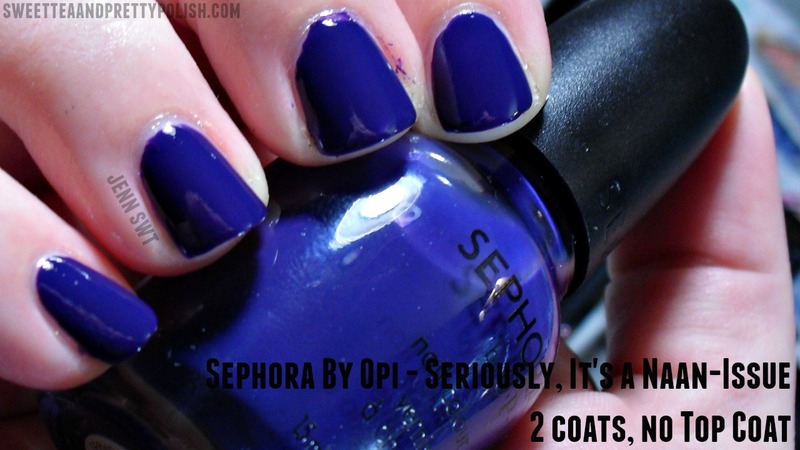 The picture above shows 1 coat over a dark purple base without a top coat under a daylight bulb. This picture doesn't do this shimmery glitter justice as it looks like a rose gold glitter bomb in person. I picked this polish up awhile back from CVS during a sale with a coupon. This was actually the polish that kick started my polish obsession once again after many years. 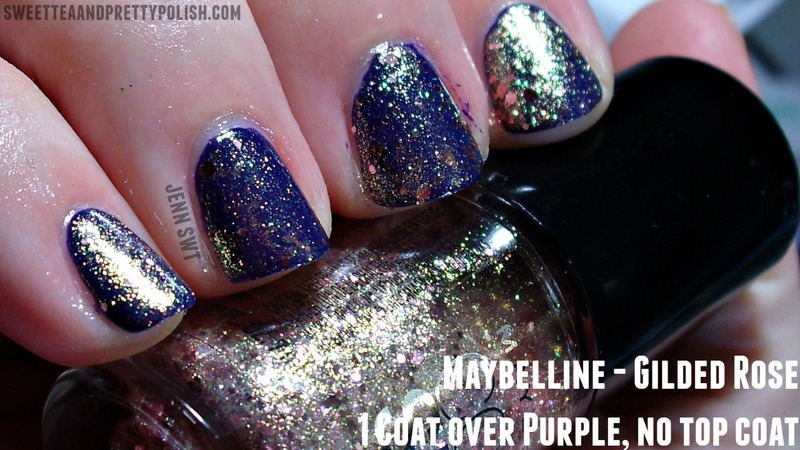 This is one of my favorite glitter polishes that I own. It has tiny yellow gold shimmer and rose gold circle glitters. You don't have to fish to get get coverage either. I picked this nail polish up from Big Lots in a 2 for $2 pack. 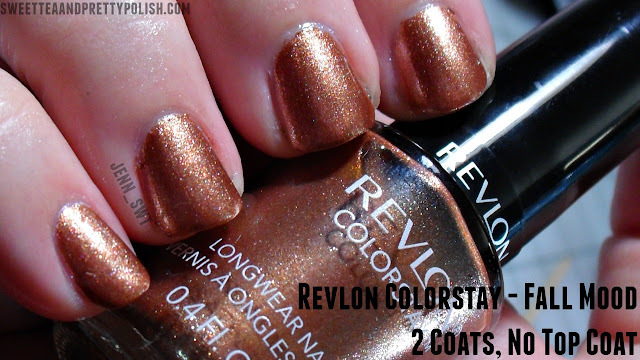 I've already shown 2 of the other amazing Revlon metallics polishes, Gold Coin and Copper Penny, in previous Swatch It Out installments. So, I knew I had to include this beauty as well. I have yet to find metallics as good as these classic Revlon stand by polishes. The price is also beyond amazing if you can find them at a discount store as well. The clear champion, for me, this time is Revlon Colorstay in Cayenne. It's just beauty in a bottle with a one coat wonderful formula to boot. 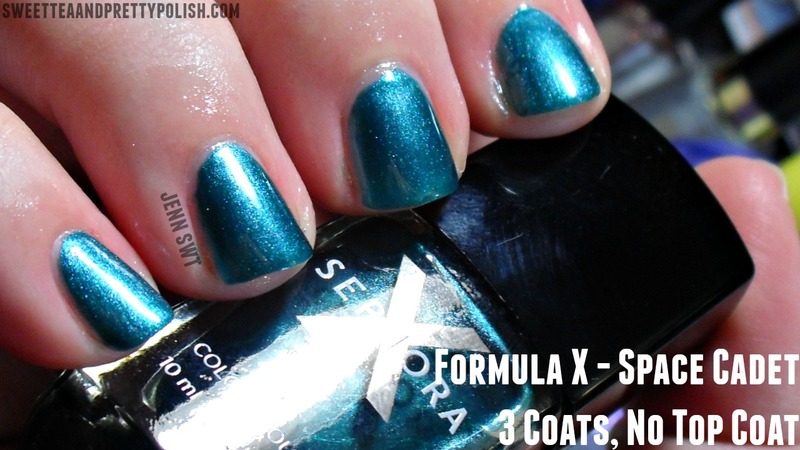 I also fell in love with Formula X - Space Cadet. I don't have any other polish like it. I bought it for the name, and I ended up with something just awesome. I don't feel that I have any duds this week. A girl could get used to this type of thing. *Not sponsored. I bought all of these with my own money except one which I received in a friend mail gift as stated above. *These are my opinions based on my experience with these particular polishes. Your experience may vary. Today, I got another DIY (Do It Yourself) idea for y'all. These are hanging organizers that didn't cost me a dime, because I made them by out of some empty soap and shampoo bottles. I decorated them at no cost as well with materials I had around the house like paper, fabric, and tape. First, you are going to need some containers to use for your hangers. I'm using some hair product, soap, and face wash containers. Most anything will work that you can fully clean it out like sauce bottles, glue bottle, or anything with the shape you want. Then, you need cut the end with the lids off and wash them completely out and let dry. Keep in mind what you want to store in each when you cut the length. You may need to file down the cut edge with some sand paper or an emery board as they can be very sharp. 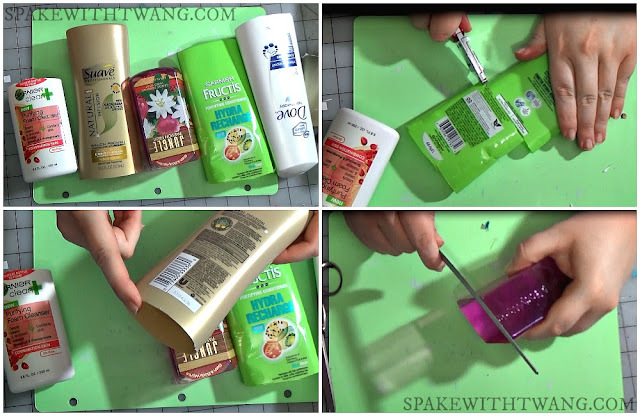 This method works best for squared containers as rounded and tapered containers tend to crinkle the tape. 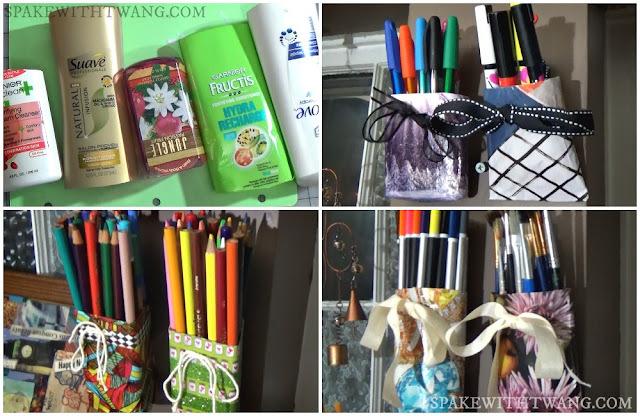 Choose some decorative tape, such as washi or fashion duct tape to put on your container. 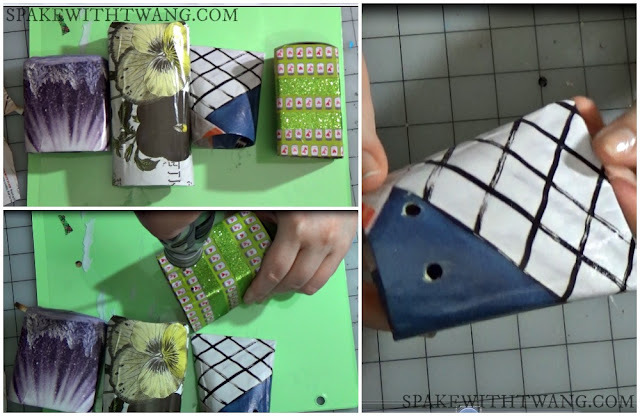 I used washi tape as shown above. I recommend using duct tape if you are going to hang your container in a moisture rich environment such as your bathroom. Choose which side that you wish to be the back or the one that will be against the wall. Place your starting end there so that all your seems will be hidden once it's hung up. Place the first level halfway above the top of the container and complete the loop around and cut off. Then, cut 4 small cuts in the corner of your tape that's left hanging over the top. Now, fold it inside, and smooth it down to give you a nice top edge and cover any sharp points. Continue adding tape layer by layer until you cover your container in the manner you desire. See below for to how to hang it. Choose a piece of paper or fabric big enough to wrap around your container and leave an inch or two overhang on the top and bottom. I recommend using fabric if your container has sides that aren't straight as it will stretch better and leave less wrinkles than paper. 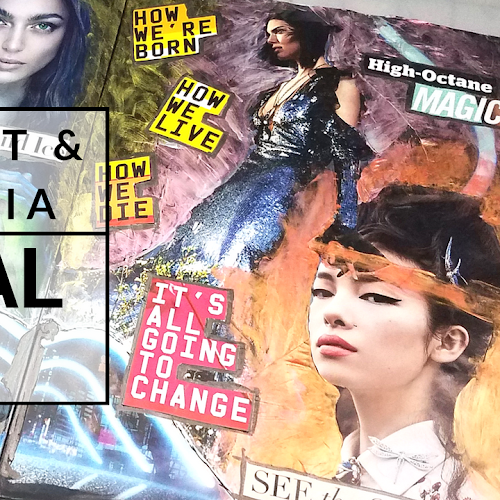 I am using a page from a magazine, but I've also used scrapbook paper, wall calendar pages, and scrap piece of fabric from an old pajama top with success. 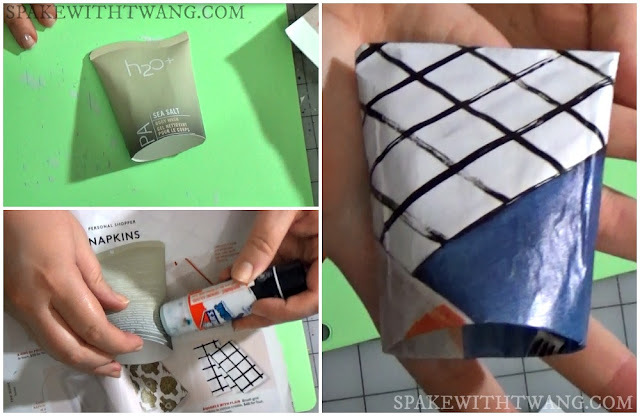 Glue and wrap around the body, leaving at least an inch overhang on top and bottom, keeping in mind what part of the page will show in the front. Fold up the bottom like you are wrapping a present, and firmly glue each part down. For the top, cut about 4 slits in the overhang pieces. Coat each liberally with glue and tuck and smooth them inside the container to create a clean and secure edge. First, decide how you want to hang it. You could hang them securely and flush to the wall by screwing through the back of the container right into the wall. This could be further aided by cutting the front lower than the back. My dad does this in his workshop with milk jugs and old rubbing alcohol bottles. It works better for heavier items like bolts and metal parts. 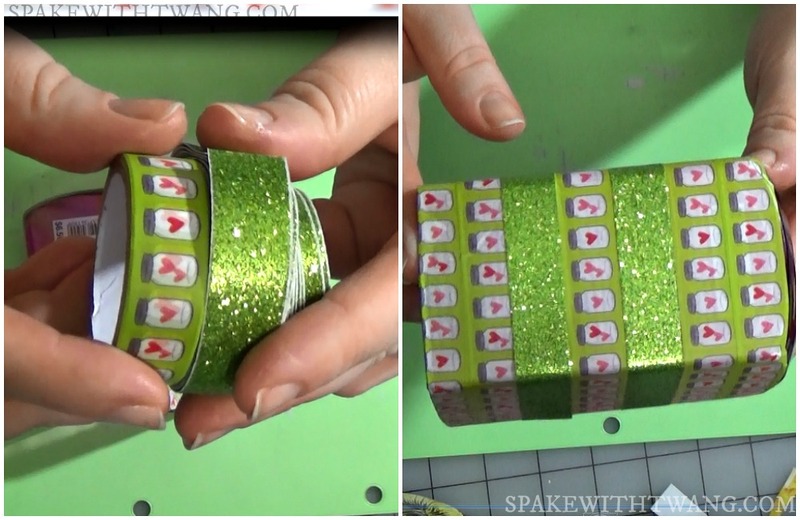 For this tutorial, I'm hanging mine on the wall next to my office desk. I also won't be storing anything heavy in them. So, I'm using ribbon and twine to hang mine. I started by making 4 holes in each of my containers: 2 in the front and 2 in the back. Keep in mind what type of string, yarn, or ribbon that you are going to be using when sizing each hole. For the thinner plastic, shown to the right, I was able to just use my paper hole punch. For the thicker plastic, I used my drill. You could probably also use an awl or just whatever you have on hand that will make holes. This is optional, but I felt it would add to the longevity of some of my container coverings. For the paper covered containers, I also put a couple coats of sealant on after I drilled the holes. I used Mod Podge, but you could use any compatible substance that dries clear like a glue wash.
Let it all completely dry before moving onto the next step. Take your string or ribbon and thread it through the four holes leaving the tails toward the front. I threaded mine through the inside of the container, because I like how it better holds the items that I'm putting inside upright. As shown in the top panel, pull the back loop to the desired length as this will be the actual hanger. Then, take the tails and tie them into your choice of a knot or bow to hold the back loop securely in place. I used ribbon on the left and butcher's twine on the right. Pick how you want to fasten them to the wall. This will depend on what you are going to cram in them, what type of surface you are fastening them to, and all that good business. 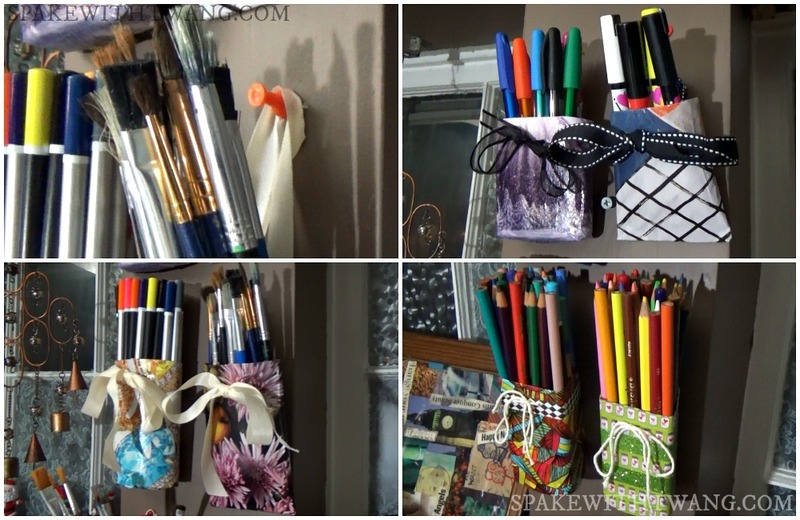 For example: if you can't make any hole in your walls for whatever reason, you make want to use Command hooks or something similar. If you are going to place them into sheetrock with no backing stud with a heavy load, you may want to use a molly bolt. The stuff I'm putting in my container is very light, and the wall I'm putting them on is sturdy. So, I just used push pins as pictured in the top left panel. If you are also using push pins, I do recommend placing the string between the base and wall instead of directly on top of the pin. That way, your container will be more secured and less likely to fall off if someone brushes by it or something. *This is not sponsored in anyway. I got this idea from my dad who has used milk jugs and other like containers are organizers in his work shop for years and years. I just thought it would be neat to "pretty" them up a bit. Also I was in need of some extra space in my tiny house to store some crap and have no extra money to spend on organizing supplies at the moment. Also, it saved a trip to the dump for recycling. Whoohoo! Two birds. One stone. 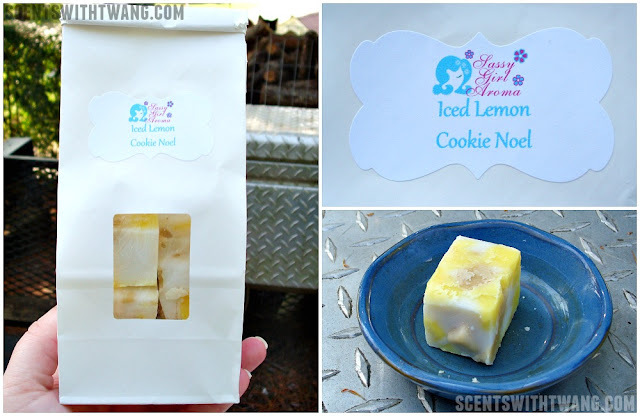 Today's wax melt review is of Iced Lemon Cookie Noel from Sassy Girl Aroma. I ordered this directly from the wax vendor's web store. It's best to join the Sassy Girl Aroma official Facebook group to learn about restocks, sales, and other related news. This is my first time melting anything from Sassy Girl Aroma, but I've heard nothing but great things. So, I expect it to do quite well. This smells delicious! The lemon is the strongest note. It is a sweet confectionery or bakery lemon. The cookie comes out next with just a hint of vanilla. It smells like those super sweet lemon cookies that you can buy in a giant pack on the bottom shelf at the supermarket that have a hole in the middle. Yum! About an hour in, the scent has completely filled my living room and most of my connecting dining room. It smells like I'm baking lemon cookies. Yes! After 4 and a half hours, it's still throwing pretty well. The scent is staying in the living room now, but I can smell it pretty strongly within 6 feet of the warmer on either side. The lemon is coming out more, but it's still a sweet sugary scent. After a little over 5 hours, it's still throwing scent but only about 1 foot or 2 from the warmer. So, I'm calling it done. I'm very happy with how this wax melt did. 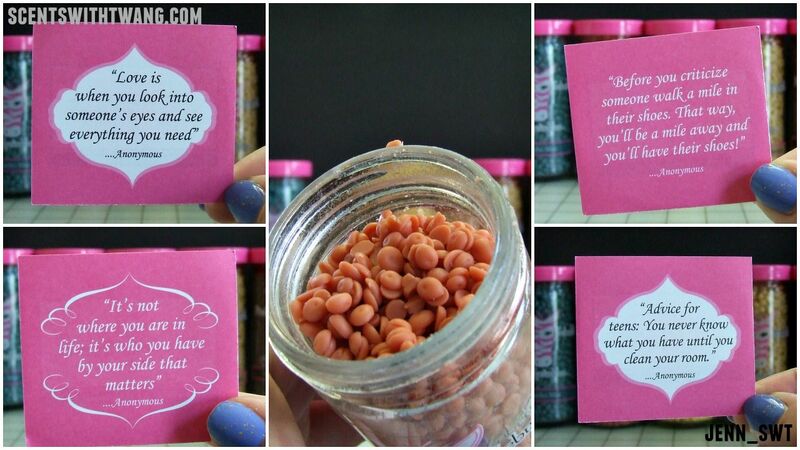 I'm especially happy since I have an entire chunk bag of this scent. Haha. My living room is the hardest room in my entire house in which to get a decent scent throw. I know to only put the strongest of wax melt beasts in there. I was worried to even try this scent in that room, because scents with vanilla and bakery notes tend to get lost and thus wasted. The fact that this one did quite well despite all the things working against it has made my first experience melting of Sassy Girl Aroma a great one. I can't wait to get some more of my wax haul items in my warmer. Whoohoo! **I couldn't find a scent description for "Iced Lemon Cookie Noel." So the one above is for "Iced Lemon Cookies." *Not sponsored. I bought this with my own money and am weird enough to write a blog post about it. *This is based on my experience with this particular melt in my home. Your experience may vary and all that jazz.